I once declared on this site that sandwiches weren’t my thing. I much preferred toast covered with ingredients over ingredients sandwiched between two thick slices of bread. For me, it is all about the ingredients, not the bread. I think I forgot about one thing: grilled cheese sandwiches. Don’t get me wrong- I love cheesy melted crostini but there is something so fundamentally right about a grilled cheese sandwich. The way the cheese oozes out and that no matter how messy, you can still eat the sandwich with your hands. I mean, I’ve been known to make grilled cheese before (like my hummus and grilled cheese or my roasted tomato and egg grilled cheese) but I guess I occasionally forget how amazing a grilled cheese sandwich can be. This sandwich is the result of having onions from the CSA that didn’t dry right and needed to be eaten soon along with a few tablespoons of pesto left over from the pesto potato skillet. You could use any cheese here but I prefer the mild taste of the mozzarella which doesn’t overpower the flavor of the pesto and caramelized onions. If you plan ahead, you can make a big batch of caramelized onions and use them for a few meals (they make a wonderful addition to homemade pizza)! Also, for an added flavor, replace the caramelized onions with balsamic onions-yum! Brush the outsides of the bread with olive oil and heat a griddle to medium-low heat. Smear 2-3 tablespoons of pesto on the inside of one of the slices and then layer tomatoes, caramelized onions, and mozzarella cheese. Cover with remaining piece of oiled bread. Cook on each side until crusty and cheese has melted. One of my very favorite sandwiches is by McMenamin’s (an institution in Oregon and on the way to becoming one up here in Washington). 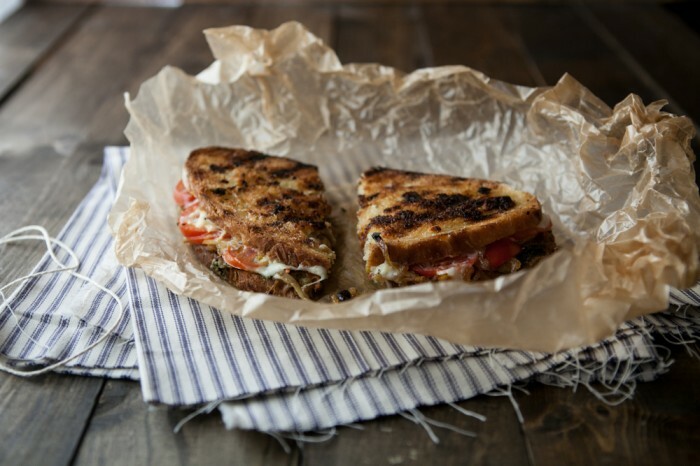 It’s smoked mozzarella on sourdough, along with pesto and juicy tomatoes, and it’s heaven. The only problem though is that I never want to try anything else on their menu because I can only focus on that amazing sandwich! Not sure why I never thought to make something similar at home, but now I think it’s something I must do. Immediately. I’m with you. But I’ll always make an exception for grilled cheese and yours looks fantastic. I just bought a panini maker,and these would be perfect to try it out! Melted mozarrela is pure comfort.. This looks yummy! I really really really want this!! I am in love with anything with caramelized onions!! So going to make this! 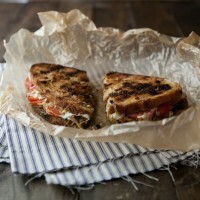 This hot, herby caramelized onion and mozzarella sandwich is right up my alley! Love it! Looks like a delicious sandwich! Making a bunch of caramelized onions at once is smart…assuming you can keep from eating all of them at once, which I’d have a hard time with. I like ingredients spread on bread in certain situations but have to go with sandwiches for others: nut butters and avocado go on bread (not together) when I’m eating at home but grilled cheese has to be sandwiched! 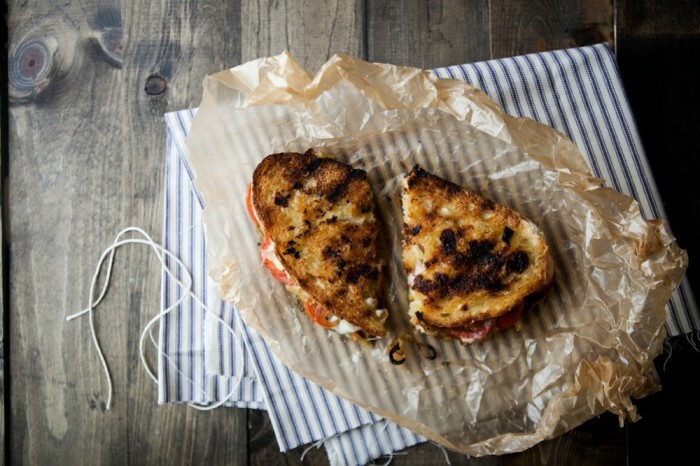 You can’t beat a grilled cheese sandwich! Your version with mozzarella, pesto, and caramelized onions sounds particularly irresistible. Wow it inspired me to make my own sandwich version, congrats for the recipe! I like it so much….i love all kind of sandwiches! 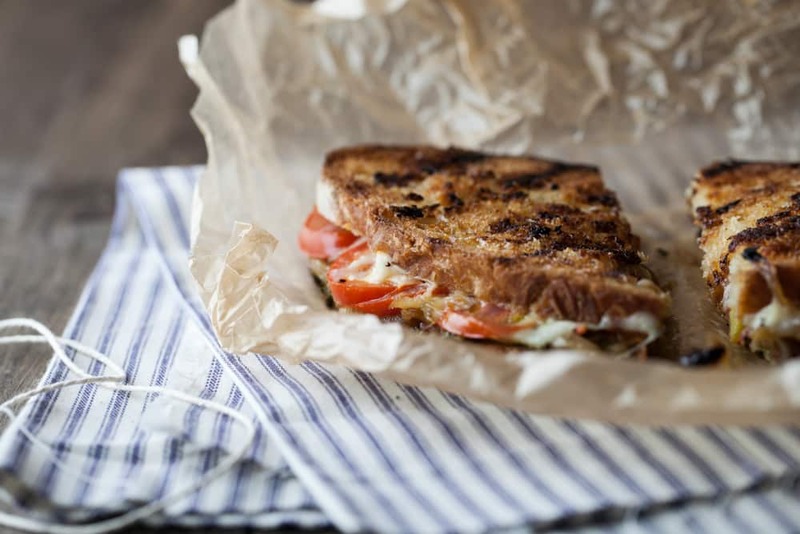 I crave grilled cheese sandwiches, and totally agree they are in a class of their own. Otherwise I’m with you toast with topping is better. I think I have all the ingredients I need to make these for my girls for lunch.